Tuscany (/ˈtʌskəni/ TUSK-ə-nee; Italian: Toscana, pronounced [toˈskaːna]) is a region in central Italy with an area of about 23,000 square kilometres (8,900 square miles) and a population of about 3.8 million inhabitants (2013). The regional capital is Florence (Firenze). Tuscany is known for its landscapes, history, artistic legacy, and its influence on high culture. It is regarded as the birthplace of the Italian Renaissance and has been home to many figures influential in the history of art and science, and contains well-known museums such as the Uffizi and the Pitti Palace. Tuscany produces wines, including Chianti, Vino Nobile di Montepulciano, Morellino di Scansano and Brunello di Montalcino. Having a strong linguistic and cultural identity, it is sometimes considered "a nation within a nation". Tuscany is a popular destination in Italy, the main tourist spots are Florence, Pisa, Lucca, Siena, Versilia, Maremma and Chianti. The village of Castiglione della Pescaia is the most visited seaside destination in the region, with seaside tourism accounting for approximately 40% of tourist arrivals. Additionally, Siena, Lucca, the Chianti region, Versilia and Val d'Orcia are also internationally renowned and particularly popular spots among travellers. Seven Tuscan localities have been designated World Heritage Sites: the historic centre of Florence (1982); the Cathedral square of Pisa (1987); the historical centre of San Gimignano (1990); the historical centre of Siena (1995); the historical centre of Pienza (1996); the Val d'Orcia (2004), and the Medici Villas and Gardens (2013). Tuscany has over 120 protected nature reserves, making Tuscany and its capital Florence popular tourist destinations that attract millions of tourists every year. In 2012, the city of Florence was the world's 89th most visited city, with over 1.834 million arrivals. 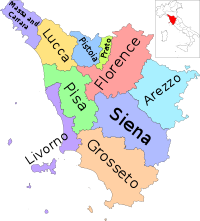 Roughly triangular in shape, Tuscany borders the regions of Liguria to the northwest, Emilia-Romagna to the north, Marche to the northeast, Umbria to the east and Lazio to the southeast. The comune (municipality) of Badia Tedalda, in the Tuscan Province of Arezzo, has an exclave named Ca' Raffaello within Emilia-Romagna. Tuscany has a western coastline on the Ligurian Sea and the Tyrrhenian Sea, among which is the Tuscan Archipelago, of which the largest island is Elba. Tuscany has an area of approximately 22,993 square kilometres (8,878 sq mi). Surrounded and crossed by major mountain chains, and with few (but fertile) plains, the region has a relief that is dominated by hilly country used for agriculture. Hills make up nearly two-thirds (66.5%) of the region's total area, covering 15,292 square kilometres (5,904 sq mi), and mountains (of which the highest are the Apennines), a further 25%, or 5,770 square kilometres (2,230 sq mi). Plains occupy 8.4% of the total area—1,930 square kilometres (750 sq mi)—mostly around the valley of the Arno. Many of Tuscany's largest cities lie on the banks of the Arno, including the capital Florence, Empoli and Pisa. The climate is fairly mild in the coastal areas, and is harsher and rainy in the interior, with considerable fluctuations in temperature between winter and summer, giving the region a soil-building active freeze-thaw cycle, in part accounting for the region's once having served as a key breadbasket of ancient Rome. The pre-Etruscan history of the area in the late Bronze and Iron Ages parallels that of the early Greeks. The Tuscan area was inhabited by peoples of the so-called Apennine culture in the late second millennium BC (roughly 1350–1150 BC) who had trading relationships with the Minoan and Mycenaean civilizations in the Aegean Sea. Following this, the Villanovan culture (1100–700 BC) saw Tuscany, and the rest of Etruria, taken over by chiefdoms. City-states developed in the late Villanovan (paralleling Greece and the Aegean) before "Orientalization" occurred and the Etruscan civilization rose. The Etruscans (Latin: Tusci) created the first major civilization in this region, large enough to establish a transport infrastructure, to implement agriculture and mining and to produce vibrant art. The Etruscans lived in the area of Etruria well into prehistory. The civilization grew to fill the area between the Arno and Tiber from the eighth century BCE, reaching its peak during the seventh and sixth centuries B.C., finally succumbing to the Romans by the first century BCE. Throughout their existence, they lost territory (in Campania) to Magna Graecia, Carthage and Celts. Despite being seen as distinct in its manners and customs by contemporary Greeks, the cultures of Greece, and later Rome, influenced the civilization to a great extent. One reason for its eventual demise was this increasing absorption by surrounding cultures, including the adoption of the Etruscan upper class by the Romans. Soon after absorbing Etruria (to the north, northeast, east and a strip to the south), Rome established the cities of Lucca, Pisa, Siena, and Florence, endowed the area with new technologies and development, and ensured peace. These developments included extensions of existing roads, introduction of aqueducts and sewers, and the construction of many buildings, both public and private. However, many of these structures have been destroyed by erosion due to weather. The Roman civilization in the West of the Roman Republic and later Roman Empire collapsed in the fifth century, and the region fell briefly to barbarians migrating through the Empire from Eastern Europe and Central Asia of the Goths (Eastern - Ostrogoths and Western - Visigoths), then was re-conquered by the revived Eastern Roman Empire (later Byzantine Empire) under the strong Emperor Justinian. In the years following 572, the Lombards arrived and designated Lucca the capital of their subsequent Tuscia. Pilgrims travelling along the Via Francigena between Rome and France brought wealth and development during the medieval period. The food and shelter required by these travellers fuelled the growth of communities around churches and taverns. The conflict between the Guelphs and Ghibellines, factions supporting the Papacy or the Holy Roman Empire in central and northern Italy during the 12th and 13th centuries, split the Tuscan people. The two factions gave rise to several powerful and rich medieval communes in Tuscany: Arezzo, Florence, Lucca, Pisa, and Siena. Balance between these communes was ensured by the assets they held: Pisa, a port; Siena, banking; and Lucca, banking and silk. But by the time of the Renaissance, Florence had become the cultural capital of Tuscany. One family that benefitted from Florence's growing wealth and power was the ruling Medici family. Its scion Lorenzo de' Medici was one of the most famous of the Medici. The legacy of his influence is visible today in the prodigious expression of art and architecture in Florence. His famous descendant Catherine de' Medici married Prince Henry (later King Henry II) of France in 1533. The Black Death epidemic hit Tuscany starting in 1348. It eventually killed 70% of the Tuscan population. According to Melissa Snell, "Florence lost a third of its population in the first six months of the plague, and from 45% to 75% of its population in the first year." In 1630, Florence and Tuscany were once again ravaged by the plague. Tuscany, especially Florence, is regarded as the birthplace of the Renaissance. Though "Tuscany" remained a linguistic, cultural and geographic conception, rather than a political reality, in the 15th century, Florence extended its dominion in Tuscany through the annexation of Arezzo in 1384, the purchase of Pisa in 1405 and the suppression of a local resistance there (1406). Livorno was bought in 1421 and became the harbour of Florence. From the leading city of Florence, the republic was from 1434 onward dominated by the increasingly monarchical Medici family. Initially, under Cosimo, Piero the Gouty, Lorenzo and Piero the Unfortunate, the forms of the republic were retained and the Medici ruled without a title, usually without even a formal office. These rulers presided over the Florentine Renaissance. There was a return to the republic from 1494 to 1512, when first Girolamo Savonarola then Piero Soderini oversaw the state. Cardinal Giovanni de' Medici retook the city with Spanish forces in 1512, before going to Rome to become Pope Leo X. Florence was dominated by a series of papal proxies until 1527 when the citizens declared the republic again, only to have it taken from them again in 1530 after a siege by an Imperial and Spanish army. At this point Pope Clement VII and Charles V appointed Alessandro de' Medici as the first formal hereditary ruler. The Sienese commune was not incorporated into Tuscany until 1555, and during the 15th century Siena enjoyed a cultural 'Sienese Renaissance' with its own more conservative character. Lucca remained an independent republic until 1847 when it became part of Grand Duchy of Tuscany by the will of its people. Piombino and other strategic towns constituted the tiny State of the Presidi under Spanish control. In the 16th century, the Medicis, rulers of Florence, annexed the Republic of Siena, creating the Grand Duchy of Tuscany. The Medici family became extinct in 1737 with the death of Gian Gastone, and Tuscany was transferred to Francis, Duke of Lorraine and husband of Austrian Empress Maria Theresa, who let the country be ruled by his son. The dynasty of the Lorena ruled Tuscany until 1860, with the exception of the Napoleonic period, when most of the country was annexed to the French Empire. After the Second Italian War of Independence, a revolution evicted the last Grand Duke, and after a plebiscite Tuscany became part of the new Kingdom of Italy. From 1864 to 1870 Florence became the second capital of the kingdom. Under Benito Mussolini, the area came under the dominance of local Fascist leaders such as Dino Perrone Compagni (from Florence), and Costanzo and Galeazzo Ciano (from Livorno). Following the fall of Mussolini and the armistice of 8 September 1943, Tuscany became part of the Nazi-controlled Italian Social Republic, and was conquered almost totally by the Anglo-American forces during summer 1944. Following the end of the Social Republic, and the transition from the Kingdom to the modern Italian Republic, Tuscany once more flourished as a cultural centre of Italy. After the establishment of regional autonomy in 1975, Tuscany has always been ruled by centre-left governments. Tuscany has an immense cultural and artistic heritage, expressed in the region's churches, palaces, art galleries, museums, villages and piazzas. Many of these artifacts are found in the main cities, such as Florence and Siena, but also in smaller villages scattered around the region, such as San Gimignano. Tuscany has a unique artistic legacy, and Florence is one of the world's most important water-colour centres, even so that it is often nicknamed the "art palace of Italy" (the region is also believed to have the largest concentration of Renaissance art and architecture in the world). Painters such as Cimabue and Giotto, the fathers of Italian painting, lived in Florence and Tuscany, as well as Arnolfo and Andrea Pisano, renewers of architecture and sculpture; Brunelleschi, Donatello and Masaccio, forefathers of the Renaissance; Ghiberti and the Della Robbias, Filippo Lippi and Angelico; Botticelli, Paolo Uccello, and the universal genius of Leonardo da Vinci and Michelangelo. The region contains numerous museums and art galleries, many housing some of the world's most precious works of art. Such museums include the Uffizi, which keeps Botticelli's The Birth of Venus, the Pitti Palace, and the Bargello, to name a few. Most of the frescos, sculptures and paintings in Tuscany are held in the region's abundant churches and cathedrals, such as Florence Cathedral, Siena Cathedral, Pisa Cathedral and the Collegiata di San Gimignano. In the medieval period and in the Renaissance, there were four main Tuscan art schools which competed against each other: the Florentine School, the Sienese School, the Pisan School and the Lucchese School. The Florentine School refers to artists in, from or influenced by the naturalistic style developed in the 14th century, largely through the efforts of Giotto di Bondone, and in the 15th century the leading school of the world. Some of the best known artists of the Florentine School are Brunelleschi, Donatello, Michelangelo, Fra Angelico, Botticelli, Lippi, Masolino, and Masaccio. The Sienese School of painting flourished in Siena between the 13th and 15th centuries and for a time rivaled Florence, though it was more conservative, being inclined towards the decorative beauty and elegant grace of late Gothic art. Its most important representatives include Duccio, whose work shows Byzantine influence; his pupil Simone Martini; Pietro and Ambrogio Lorenzetti; Domenico and Taddeo di Bartolo; and Sassetta and Matteo di Giovanni. Unlike the naturalistic Florentine art, there is a mystical streak in Sienese art, characterized by a common focus on miraculous events, distortions of time and place, and often dreamlike coloration, with less attention to proportions. In the 16th century the Mannerists Beccafumi and Il Sodoma worked there. While Baldassare Peruzzi was born and trained in Siena, his major works and style reflect his long career in Rome. The economic and political decline of Siena by the 16th century, and its eventual subjugation by Florence, largely checked the development of Sienese painting, although it also meant that many Sienese works in churches and public buildings were not discarded or destroyed by new paintings or rebuilding. Siena remains a remarkably well-preserved Italian late-Medieval town. The Lucchese School, also known as the School of Lucca and as the Pisan-Lucchese School, was a school of painting and sculpture that flourished in the 11th and 12th centuries in the western and southern part of the region, with an important center in Volterra. The art is mostly anonymous. Although not as elegant or delicate as the Florentine School, Lucchese works are remarkable for their monumentality. Apart from standard Italian, the Tuscan dialect (dialetto toscano) is spoken in Tuscany. The Italian language is a "literary version" of Tuscan. It became the language of culture for all the people of Italy, thanks to the prestige of the masterpieces of Dante Alighieri, Petrarch, Giovanni Boccaccio, Niccolò Machiavelli and Francesco Guicciardini. It would later become the official language of all the Italian states and of the Kingdom of Italy, when it was formed. Tuscany has a rich ancient and modern musical tradition, and has produced numerous composers and musicians, including Giacomo Puccini and Pietro Mascagni. Florence is the main musical centre of Tuscany. The city was at the heart of much of the Western musical tradition. It was there that the Florentine Camerata convened in the mid-16th century and experimented with setting tales of Greek mythology to music and staging, resulting in the first operas, fostering the further development of the operatic form, and the later developments of separate "classical" forms such as the symphony. There are numerous musical centres in Tuscany. Arezzo is indelibly connected with the name of Guido d'Arezzo, the 11th-century monk who invented modern musical notation and the do-re-mi system of naming notes of the scale; Lucca hosted possibly the greatest Italian composer of Romanticism, Giacomo Puccini; and Siena is well known for the Accademia Musicale Chigiana, an organization that currently sponsors major musical activities such as the Siena Music Week and the Alfredo Casella International Composition Competition. Other important musical centres in Tuscany include Livorno, Pisa and Grosseto. Several famous writers and poets are from Tuscany, most notably Florentine author Dante Alighieri. Tuscany's literary scene particularly thrived in the 13th century and the Renaissance. In Tuscany, especially in the Middle Ages, popular love poetry existed. A school of imitators of the Sicilians was led by Dante da Maiano, but its literary originality took another line — that of humorous and satirical poetry. The democratic form of government created a style of poetry which stood strongly against the medieval mystic and chivalrous style. Devout invocation of God or of a lady came from the cloister and the castle; in the streets of the cities everything that had gone before was treated with ridicule or biting sarcasm. Folgóre da San Gimignano laughs when in his sonnets he tells a party of Sienese youths the occupations of every month in the year, or when he teaches a party of Florentine lads the pleasures of every day in the week. Cenne della Chitarra laughs when he parodies Folgore's sonnets. The sonnets of Rustico di Filippo are half-fun and half-satire, as is the work of Cecco Angiolieri of Siena, the oldest humorist we know, a far-off precursor of François Rabelais and Michel de Montaigne. Another type of poetry also began in Tuscany. Guittone d'Arezzo made art abandon chivalry and Provençal forms for national motives and Latin forms. He attempted political poetry, and although his work is often obscure, he prepared the way for the Bolognese school. Bologna was the city of science, and philosophical poetry appeared there. Guido Guinizelli was the poet after the new fashion of the art. In his work the ideas of chivalry are changed and enlarged. Only those whose heart is pure can be blessed with true love, regardless of class. He refuted the traditional credo of courtly love, for which love is a subtle philosophy only a few chosen knights and princesses could grasp. Love is blind to blasons but not to a good heart when it finds one: when it succeeds it is the result of the spiritual, not physical affinity between two souls. Guinizzelli's democratic view can be better understood in the light of the greater equality and freedom enjoyed by the city-states of the center-north and the rise of a middle class eager to legitimise itself in the eyes of the old nobility, still regarded with respect and admiration but in fact dispossessed of its political power. Guinizelli's Canzoni make up the bible of Dolce Stil Novo, and one in particular, "Al cor gentil" ("To a Kind Heart") is considered the manifesto of the new movement which would bloom in Florence under Cavalcanti, Dante and their followers. His poetry has some of the faults of the school of d'Arezzo. Nevertheless, he marks a great development in the history of Italian art, especially because of his close connection with Dante's lyric poetry. In the 13th century, there were several major allegorical poems. One of these is by Brunetto Latini, who was a close friend of Dante. His Tesoretto is a short poem, in seven-syllable verses, rhyming in couplets, in which the author professes to be lost in a wilderness and to meet with a lady, who represents Nature, from whom he receives much instruction. We see here the vision, the allegory, the instruction with a moral object, three elements which we shall find again in the Divine Comedy. Francesco da Barberino, a learned lawyer who was secretary to bishops, a judge, and a notary, wrote two little allegorical poems, the Documenti d'amore and Del reggimento e dei costumi delle donne. The poems today are generally studied not as literature, but for historical context. A fourth allegorical work was the Intelligenza, which is sometimes attributed to Compagni, but is probably only a translation of French poems. In the 15th century, humanist and publisher Aldus Manutius published the Tuscan poets Petrarch and Dante Alighieri (Divine Comedy), creating the model for what became a standard for modern Italian. Simplicity is central to the Tuscan cuisine. Legumes, bread, cheese, vegetables, mushrooms and fresh fruit are used. Olive oil is made up of Moraiolo, Leccino and Frantoiano olives. White truffles from San Miniato appear in October and November. Beef of the highest quality comes from the Chiana Valley, specifically a breed known as Chianina used for Florentine steak. The indigenous Cinta Senese breed of pork is also produced. Wine is a famous and common produce of Tuscany. Chianti is arguably the most well-known internationally. So many British tourists come to the area where Chianti wine is produced that this specific area has been nicknamed "Chiantishire". Between 1851 and 1860, the Grand Duchy of Tuscany, an independent Italian state until 1859 when it joined the United Provinces of Central Italy, produced two postage stamp issues which are among the most prized classic stamp issues of the world, and include the most valuable Italian stamp. The Grand Duchy of Tuscany was an independent Italian state from 1569 to 1859, but was occupied by France from 1808 to 1814. The Duchy comprised most of the present area of Tuscany, and its capital was Florence. In December 1859, the Grand Duchy officially ceased to exist, being joined to the duchies of Modena and Parma to form the United Provinces of Central Italy, which was annexed by the Kingdom of Sardinia a few months later in March 1860. In 1862 it became part of Italy, and joined the Italian postal system. The unemployment rate stood at 8.6% in 2017 and was slightly lower than the national average. The subsoil in Tuscany is relatively rich in mineral resources, with iron ore, copper, mercury and lignite mines, the famous soffioni (fumarole) at Larderello, and the vast marble mines in Versilia. Although its share is falling all the time, agriculture still contributes to the region's economy. In the region's inland areas cereals, potatoes, olives and grapes are grown. The swamplands, which used to be marshy, now produce vegetables, rice, tobacco, beets and sunflowers. The industrial sector is dominated by mining, given the abundance of underground resources. Also of note are textiles, chemicals/pharmaceuticals, metalworking and steel, glass and ceramics, clothing and printing/publishing sectors. Smaller areas specialising in manufacturing and craft industries are found in the hinterland: the leather and footwear area in the south-west part of the province of Florence, the hot-house plant area in Pistoia, the ceramics and textile industries in the Prato area, scooters and motorcycles in Pontedera, and the processing of timber for the manufacture of wooden furniture in the Cascina area. The heavy industries (mining, steel and mechanical engineering) are concentrated along the coastal strip (Livorno and Pisa areas), where there are also important chemical industries. Also of note are the marble (Carrara area) and paper industries (Lucca area). Tuscany is a traditionally popular destination in Italy, and the main tourist destinations by number of tourist arrivals are Florence, Pisa, Montecatini Terme, Castiglione della Pescaia and Grosseto. Additionally, the Chianti region, Versilia and Val d'Orcia are also internationally renowned and particularly popular spots among travellers. As far as seaside tourism is concerned, which represents 40% of tourist arrivals in the region, Castiglione della Pescaia's sea has been repeatedly nominated as Italy's best sea by the Italian non-governmental environmentalist organisation Legambiente. Castiglione gained the first place in the most recent ranking too, published in 2015. The town is also the most visited seaside destination in Tuscany, and fourth most visited overall, with circa 1.3 million tourist arrivals recorded in 2015. Other popular seaside destination are Grosseto (second most popular after Castiglione), Orbetello (third most popular), Monte Argentario, Viareggio, Elba and Giglio Island. The Via de' Tornabuoni in Florence, the city's top fashion and shopping street, contains some of the world's most luxurious clothing and jewelry houses, such as Cartier, Ferragamo, Gucci, Versace and Bulgari, to name a few. The fashion and textile industry are the pillars of the Florentine economy. In the 15th century, Florentines were working with luxury textiles such as wool and silk. Today the greatest designers in Europe utilize the textile industry in Tuscany, and especially Florence. Italy has one of the strongest textile industries in Europe, accounting for approximately one quarter of European production. Its turnover is over 25 billion euros. It is the third largest supplier of clothing after China and Japan. The Italian fashion industry generates 60% of its turnover abroad. The population density of Tuscany, with 161 inhabitants per square kilometre (420/sq mi) in 2008, is below the national average (198.8/km2 or 515/sq mi). This is due to the low population density of the provinces of Arezzo, Siena, and especially Grosseto (50/km2 or 130/sq mi). The highest density is found in the province of Prato (675/km2 or 1,750/sq mi), followed by the provinces of Pistoia, Livorno, Florence and Lucca, peaking in the cities of Florence (more than 3,500/km2 or 9,100/sq mi), Livorno, Prato, Viareggio, Forte dei Marmi and Montecatini Terme (all with a population density of more than 1,000/km2 or 2,600/sq mi). The territorial distribution of the population is closely linked to the socio-cultural and, more recently, economic and industrial development of Tuscany. Accordingly, the least densely populated areas are those where the main activity is agriculture, unlike the others where, despite the presence of a number of large industrial complexes, the main activities are connected with tourism and associated services, alongside many small firms in the leather, glass, paper and clothing sectors. Italians make up 93% of the total population. Starting from the 1980s, the region has attracted a large flux of immigrants, particularly from China. There is also a significant community of British and American residents. As of 2008, the Italian national institute of statistics ISTAT estimated that 275,149 foreign-born immigrants live in Tuscany, equal to 7% of the total regional population. Tuscany is a stronghold of the center-left Democratic Party (PD), forming with Emilia-Romagna, Umbria and Marche the so-called Italian political "Red Quadrilateral". Since 1970, Tuscany has been continuously governed by the Socialist-Communist or PD-led governments. At the February 2013 elections, Tuscany gave more than 40% of its votes to Pier Luigi Bersani, and only 20.7% to Silvio Berlusconi. At the 2014 European elections, Tuscany gave 56.4% of its votes to Matteo Renzi's center-left Democratic Party. Tuscany was one of only three regions to vote YES in the 2016 Italian constitutional referendum. ^ "Statistiche demografiche ISTAT". Retrieved 10 March 2010. ^ a b "ISTAT - Regional GDP". www.dati.istat.it. Archived from the original on 24 March 2018. Retrieved 23 January 2018. ^ a b c "La Maremma regina del turismo. Solo le città d'arte la superano. Castiglione presenze record". 8 October 2015. ^ Florence receives an average of 10 million tourists a year, making the city one of the most visited in the world. ^ Bremner, Caroline; Grant, Michelle (27 January 2014). "Top 100 City Destinations Ranking". Euromonitor International. Retrieved 6 July 2014. ^ a b c d e "TOSCANA - Geography and history". Archived from the original on 21 July 2011. Retrieved 9 March 2011. Text finalised in March 2004 - Eurostat. ^ Military Channel (Discovery Network) documentary series Rome: Power and Glory, episode "The Grasp of an Empire", copyright unknown, rebroadcast 11-12:00 hrs EDST, 2009-06-29. ^ Kohn, George C. (2008). Encyclopedia of Plague and Pestilence: From Ancient Times to the Present. Infobase Publishing. p. 126. ISBN 0-8160-6935-2. ^ Benedictow, Ole Jørgen (2004). The Black Death, 1346-1353: The Complete History. Boydell & Brewer. p. 303. ISBN 0-85115-943-5. ^ "The Economic Impact of the Black Death". EH.Net. Archived from the original on 13 March 2010. ^ Snell, Melissa (2006). "The Great Mortality". About.com Education. Retrieved 19 April 2009. ^ Cipolla, Carlo M. (1981). Fighting the Plague in Seventeenth Century Italy. Madison: University of Wisconsin Press. ^ Miner, Jennifer (2 September 2008). "Florence Art Tours, Florence Museums, Florence Architecture". Travelguide.affordabletours.com. Archived from the original on 29 January 2010. Retrieved 18 April 2010. ^ "Florentine Art and Architecture". Annenberg Learner. Retrieved 28 January 2016. ^ a b "History of the Language | Italy". Lifeinitaly.com. Retrieved 18 April 2010. ^ "Regional Unemployment by NUTS2 Region". Eurostat. ^ a b "Legambiente e Touring Club Italiano presentano: "Il Mare più bello", la Guida Blu 2015 - Legambiente". ^ "::: Ministero dell'Interno ::: Archivio Storico delle Elezioni". Barker, Graeme; Rasmussen, Tom (2000). The Etruscans. Malden, MA: Blackwell. ISBN 0-631-22038-0. Jones, Emma (2005). Adventure Guide Tuscany & Umbria. Edison, NJ: Hunter. ISBN 1-58843-399-4. Cosimo III de' Medici (14 August 1642 – 31 October 1723) was the penultimate (sixth) Medici Grand Duke of Tuscany. He reigned from 1670 to 1723, and was the elder son of Grand Duke Ferdinando II. Cosimo's 53-year-long reign, the longest in Tuscan history, was marked by a series of ultra-reactionary laws which regulated prostitution and banned May celebrations. His reign also witnessed Tuscany's deterioration to previously unknown economic lows. He was succeeded by his elder surviving son, Gian Gastone, when he died, in 1723.He married Marguerite Louise d'Orléans, a cousin of Louis XIV. The marriage was solemnized by proxy in the King's Chapel at the Louvre, on Sunday, 17 April 1661. It was a marriage fraught with tribulation. Marguerite Louise eventually abandoned Tuscany for the Convent of Montmartre. Together, they had three children: Ferdinando in 1663, Anna Maria Luisa, Electress Palatine, in 1667, and Gian Gastone, the last Medicean ruler of Tuscany, in 1671. In later life, he attempted to have Anna Maria Luisa recognised as the universal heiress of Tuscany, but Charles VI, Holy Roman Emperor, would not allow it because Tuscany was an imperial fief, and he felt he alone could alter the Tuscan laws of succession. All Cosimo's efforts to salvage the plan foundered, and in 1737, upon his younger son's death, Tuscany passed to the House of Lorraine. Cosimo I de' Medici (12 June 1519 – 21 April 1574) was the second Duke of Florence from 1537 until 1569, when he became the first Grand Duke of Tuscany, a title he held until his death. Elba (Italian: isola d'Elba, pronounced [ˈiːzola ˈdelba]; Latin: Ilva; Ancient Greek: Αἰθαλία, Aithalia) is a Mediterranean island in Tuscany, Italy, 10 kilometres (6.2 mi) from the coastal town of Piombino, and the largest island of the Tuscan Archipelago. It is also part of the Arcipelago Toscano National Park, and the third largest island in Italy, after Sicily and Sardinia. It is located in the Tyrrhenian Sea about 50 kilometres (30 mi) east of the French island of Corsica. The island is part of the province of Livorno and is divided into seven municipalities, with a total population of about 30,000 inhabitants which increases considerably during the summer. The municipalities are Portoferraio (which is also the island's principal town), Campo nell'Elba, Capoliveri, Marciana, Marciana Marina, Porto Azzurro, and Rio. Ferdinand III (German: Ferdinand Josef Johann Baptist; Italian: Ferdinando Giuseppe Giovanni Baptista; English: Ferdinand Joseph John Baptist; 6 May 1769 – 18 June 1824) was Grand Duke of Tuscany from 1790 to 1801 and, after a period of disenfranchisement, again from 1814 to 1824. He was also the Prince-elector and Grand Duke of Salzburg (1803–1805) and Grand Duke of Würzburg (1805–1814). Ferdinando II de' Medici (14 July 1610 – 23 May 1670) was grand duke of Tuscany from 1621 to 1670. He was the eldest son of Cosimo II de' Medici and Maria Maddalena of Austria. His 49-year rule was punctuated by the beginning of Tuscany's long economic decline. He married Vittoria della Rovere, a first cousin, with whom he had two children who reached adulthood: Cosimo III de' Medici, his eventual successor, and Francesco Maria de' Medici, Duke of Rovere and Montefeltro, a cardinal. Ferdinando I de' Medici, Grand Duke of Tuscany (30 July 1549 – 17 February 1609) was Grand Duke of Tuscany from 1587 to 1609, having succeeded his older brother Francesco I.
Florence ( FLORR-ənss; Italian: Firenze, [fiˈrɛntse] (listen); Tuscan: Fiorenza) is the capital city of the Italian region of Tuscany. It is the most populous city in Tuscany, with 383,084 inhabitants in 2013, and over 1,520,000 in its metropolitan area.Florence was a centre of medieval European trade and finance and one of the wealthiest cities of that era. It is considered the birthplace of the Renaissance, and has been called "the Athens of the Middle Ages". Its turbulent political history includes periods of rule by the powerful Medici family and numerous religious and republican revolutions. From 1865 to 1871 the city served as the capital of the Kingdom of Italy (established in 1861). The Florentine dialect forms the base of Standard Italian and it became the language of culture throughout Italy due to the prestige of the masterpieces by Dante Alighieri, Petrarch, Giovanni Boccaccio, Niccolò Machiavelli and Francesco Guicciardini. The city attracts millions of tourists each year, and UNESCO declared the Historic Centre of Florence a World Heritage Site in 1982. The city is noted for its culture, Renaissance art and architecture and monuments. The city also contains numerous museums and art galleries, such as the Uffizi Gallery and the Palazzo Pitti, and still exerts an influence in the fields of art, culture and politics. Due to Florence's artistic and architectural heritage, Forbes has ranked it as one of the most beautiful cities in the world.Florence plays an important role in Italian fashion, and is ranked in the top 15 fashion capitals of the world; furthermore, it is a major national economic centre, as well as a tourist and industrial hub. In 2008 the city had the 17th-highest average income in Italy. Francesco I (25 March 1541 – 19 October 1587) was the second Grand Duke of Tuscany, ruling from 1574 until his death in 1587, a member of the House of Medici. Francis I (German: Franz Stefan, French: François Étienne; 8 December 1708 – 18 August 1765) was Holy Roman Emperor and Grand Duke of Tuscany, though his wife Maria Theresa effectively executed the real powers of those positions. They were the founders of the Habsburg-Lorraine dynasty. From 1728 until 1737 he was Duke of Lorraine. Francis traded the duchy to the ex-Polish king Stanisław Leszczyński in exchange for the Grand Duchy of Tuscany as one of the terms ending the War of the Polish Succession in November 1738. The duchy and the ducal title to Lorraine and Bar passed to King Louis XV of France upon Leszczynski's death in 1766, though Francis and his successors retained the right to style themselves as dukes of Lorraine and Bar. The Grand Duchy of Tuscany (Italian: Granducato di Toscana; Latin: Magnus Ducatus Etruriae) was a central Italian monarchy that existed, with interruptions, from 1569 to 1859, replacing the Duchy of Florence. The grand duchy's capital was Florence. Tuscany was nominally a state of the Holy Roman Empire until the Treaty of Campo Formio in 1797.Initially, Tuscany was ruled by the House of Medici until the extinction of its senior branch in 1737. While not as internationally renowned as the old republic, the grand duchy thrived under the Medici and it bore witness to unprecedented economic and military success under Cosimo I and his sons, until the reign of Ferdinando II, which saw the beginning of the state's long economic decline. It peaked under Cosimo III. The Medicis' only advancement in the latter days of their existence was their elevation to royalty, by the Holy Roman Emperor, in 1691. Francis Stephen of Lorraine, a cognatic descendant of the Medici, succeeded the family and ascended the throne of his Medicean ancestors. Tuscany was governed by a viceroy, Marc de Beauvau-Craon, for his entire rule. His descendants ruled, and resided in, the grand duchy until its end in 1859, barring one interruption, when Napoleon Bonaparte gave Tuscany to the House of Bourbon-Parma. Following the collapse of the Napoleonic system in 1814, the grand duchy was restored. The United Provinces of Central Italy, a client state of the Kingdom of Sardinia-Piedmont, annexed Tuscany in 1859. Tuscany was formally annexed to Sardinia in 1860, as a part of the unification of Italy, following a landslide referendum, in which 95% of voters approved. The House of Medici (English: MED-i-chee or UK: mə-DEE-chee, Italian: [ˈmɛːditʃi]) was an Italian banking family and political dynasty that first began to gather prominence under Cosimo de' Medici in the Republic of Florence during the first half of the 15th century. The family originated in the Mugello region of Tuscany, and prospered gradually until it was able to fund the Medici Bank. This bank was the largest in Europe during the 15th century, and it facilitated the Medicis' rise to political power in Florence, although they officially remained citizens rather than monarchs until the 16th century. The Medici produced four Popes of the Catholic Church—Pope Leo X (1513–1521), Pope Clement VII (1523–1534), Pope Pius IV (1559–1565) and Pope Leo XI (1605)—and two queens of France—Catherine de' Medici (1547–1589) and Marie de' Medici (1600–1630). In 1532, the family acquired the hereditary title Duke of Florence. In 1569, the duchy was elevated to the Grand Duchy of Tuscany after territorial expansion. The Medicis ruled the Grand Duchy from its inception until 1737, with the death of Gian Gastone de' Medici. The grand duchy witnessed degrees of economic growth under the early grand dukes, but was bankrupt by the time of Cosimo III de' Medici (r. 1670-1723). The Medicis' wealth and influence was initially derived from the textile trade guided by the wool guild of Florence, the Arte della Lana. Like other families ruling in Italian signorie, the Medicis dominated their city's government, were able to bring Florence under their family's power, and created an environment in which art and humanism flourished. They and other families of Italy inspired the Italian Renaissance, such as the Visconti and Sforza in Milan, the Este in Ferrara, the Borgia in Rome, and the Gonzaga in Mantua. The Medici Bank, from when it was created in 1397 to its fall in 1494, was one of the most prosperous and respected institutions in Europe, and the Medici family was considered the wealthiest in Europe for a time. From this base, they acquired political power initially in Florence and later in wider Italy and Europe. They were among the earliest businesses to use the general ledger system of accounting through the development of the double-entry bookkeeping system for tracking credits and debits. The Medici family bankrolled the invention of the piano and opera, funded the construction of Saint Peter Basilica and Santa Maria del Fiore, and patronized Leonardo, Michelangelo, Machiavelli and Galileo. They were also protagonists of the counter-reformation, from the beginning of the reformation through the Council of Trent and the French wars of religion. The Kingdom of Etruria (; Italian: Regno di Etruria) was a kingdom between 1801 and 1807 which made up a large part of modern Tuscany. It took its name from Etruria, the old Roman name for the land of the Etruscans.The kingdom was created by the Treaty of Aranjuez, signed at Aranjuez, Spain on 21 March 1801. In the context of a larger agreement between Napoleonic France and Spain, the Bourbons of Parma were compensated for the loss of their territory in northern Italy (which had been occupied by French troops since 1796). Ferdinand, Duke of Parma ceded his duchy to France, and in return his son Louis I was granted the Kingdom of Etruria (which was created from the Grand Duchy of Tuscany). To make way for the Bourbons, the Habsburg Grand Duke of Tuscany Ferdinand III was ousted and compensated with the Electorate of Salzburg. Originally the Grand Duchy of Tuscany, Etruria had been ceded to the Bourbons in 1801 in the person of Charles IV's eldest daughter and her Italian consort.Outside the Treaty of Aranjuez, Spain also secretly agreed to retrocede the Louisiana territory (over 2 million square kilometers) back to France in order to secure the Kingdom of Etruria as a client state for Spain; Louisiana was first ceded by France to Spain in 1763 at the end of the Seven Years' War. Louisiana was duly transferred to France on 15 October 1802, after the signing of the Treaty of Aranjuez. Napoleon subsequently sold Louisiana in the Louisiana Purchase on December 20, 1803, in order to pay for his French armies during the War of the Third Coalition. The first king (Louis I) died young in 1803, and his underage son Charles Louis succeeded him. His mother, Maria Luisa of Spain, was appointed regent. However, since Etruria was troubled with smuggling and espionage Napoleon annexed the territory, thus becoming the last non-Bonaparte Italian kingdom on the Peninsula. Since Spain's only hope of compensation lay in Portugal, co-operation with the emperor became more important.In 1807, Napoleon dissolved the kingdom and integrated it into France, turning it into three French départements: Arno, Méditerranée and Ombrone. The king and his mother were promised the throne of a new Kingdom of Northern Lusitania (in northern Portugal), but this plan was never realized due to the break between Napoleon and the Spanish Bourbons in 1808. After his downfall in 1814, Tuscany was restored to its Habsburg Grand Dukes. In 1815, the Duchy of Lucca was carved out of Tuscany as compensation for the Bourbons of Parma until they resumed their rule in 1847. Leopold II (Peter Leopold Joseph Anton Joachim Pius Gotthard; 5 May 1747 – 1 March 1792) was Holy Roman Emperor, King of Hungary, and Bohemia from 1790 to 1792, and Archduke of Austria and Grand Duke of Tuscany from 1765 to 1790. He was the earliest opponent of capital punishment in modern history. He was a son of Emperor Francis I and his wife, Empress Maria Theresa, and the brother of Marie Antoinette, Queen of France and Joseph II, Holy Roman Emperor. Leopold was a moderate proponent of enlightened absolutism. He granted the Academy of Georgofili his protection. The rulers of Tuscany have varied over time, sometimes being margraves, the rulers of handfuls of border counties and sometimes the heads of the most important family of the region. Livorno (Italian: [liˈvorno] (listen)) is a port city on the Ligurian Sea on the western coast of Tuscany, Italy. It is the capital of the Province of Livorno, having a population of 158,493 residents in December 2017. It has traditionally been known in English as Leghorn (pronounced leg-AWRN, LEG-hawrn or LEG-ərn). Lucca (Italian pronunciation: [ˈlukka] (listen)) is a city and comune in Tuscany, Central Italy, on the Serchio, in a fertile plain near the Tyrrhenian Sea. It is the capital of the Province of Lucca. It is famous for its intact Renaissance-era city walls. Pisa (; Italian: [ˈpiːza] (listen), locally also [ˈpiːsa]) is a city and comune in Tuscany, central Italy, straddling the Arno just before it empties into the Ligurian Sea. It is the capital city of the Province of Pisa. Although Pisa is known worldwide for its leaning tower (the bell tower of the city's cathedral), the city of over 91,104 residents (around 200,000 with the metropolitan area) contains more than 20 other historic churches, several medieval palaces, and various bridges across the Arno. Much of the city's architecture was financed from its history as one of the Italian maritime republics. The city is also home of the University of Pisa, which has a history going back to the 12th century and also has the Scuola Normale Superiore di Pisa, founded by Napoleon in 1810, and its offshoot, the Sant'Anna School of Advanced Studies, as the best-sanctioned Superior Graduate Schools in Italy. The Republic of Florence, also known as the Florentine Republic (Italian: Repubblica Fiorentina, pronounced [reˈpubblika fjorenˈtiːna], or Repubblica di Firenze), was a medieval and early modern state that was centered on the Italian city of Florence in Tuscany. The republic originated in 1115, when the Florentine people rebelled against the Margraviate of Tuscany upon the death of Matilda of Tuscany, a woman who controlled vast territories that included Florence. The Florentines formed a commune in her successors' place. The republic was ruled by a council known as the Signoria of Florence. The signoria was chosen by the gonfaloniere (titular ruler of the city), who was elected every two months by Florentine guild members. The republic had a checkered history of coups and counter-coups against various factions. The Medici faction gained governance of the city in 1434 under Cosimo de' Medici. The Medici kept control of Florence until 1494. Giovanni de' Medici (later Pope Leo X) re-conquered the republic in 1512. Florence repudiated Medici authority for a second time in 1527, during the War of the League of Cognac. The Medici re-assumed their rule in 1531 after an 11-month siege of the city. The republican government was disestablished in 1532, when Pope Clement VII appointed Alessandro de' Medici "Duke of the Florentine Republic", making the "republic" a hereditary monarchy. Siena (Italian pronunciation: [ˈsjɛːna] (listen); in English sometimes spelled Sienna; Latin: Sena Iulia) is a city in Tuscany, Italy. It is the capital of the province of Siena. The historic centre of Siena has been declared by UNESCO a World Heritage Site. It is one of the nation's most visited tourist attractions, with over 163,000 international arrivals in 2008. Siena is famous for its cuisine, art, museums, medieval cityscape and the Palio, a horse race held twice a year.